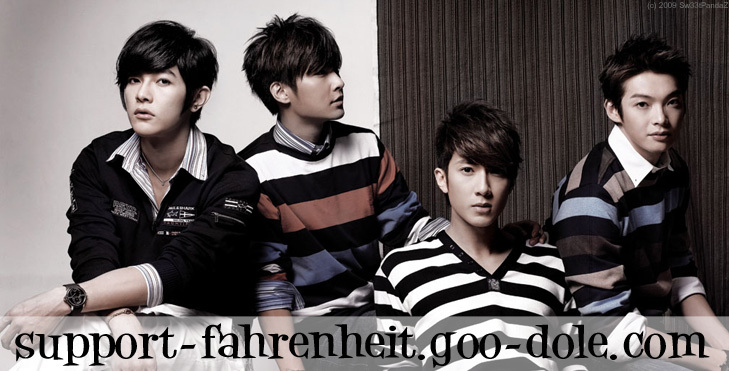 8/15/2009 Fahrenheit Become Taiwan's Tourguides! Fahrenheit; Wu Chun, Jiro Wang, Calvin Chen and Arron Yan became one day tour guides in Yilan. Coming from Japan, Korea, America, Malaysia, Singapore and other countries, 800 fans came to experience for themselves Taiwan's traditional culture and food. This enormous group of fans came to visit Taiwan for 4 days and 3 nights, the fee for each individual on average was 40 000NT, the tour guides Fahrenheit helped bring in 32 Million NT into Taiwan's tourism industry. Fahrenheit becoming tour guides smoothly brought the fans to Yilan, taking in turns to introduce Taiwan's traditional artistic culture: Calvin performed a glove puppet show, Arron made Tang Hu Lu (candied fruit on skewers), to revive his artistic work since graduation Jiro personally hand painted on the oil paper on the umbrella. Wu Chun was the "groom" and had to on the spot "carry the bride", showing of his good stature. The lucky fan that got to become the bride also had pictures taken with the 4 members, expressing a sense of shyness and shock but delightfully smiling. Fans becoming over enthusiastic, Wu Chun and Jiro counted numerous incidences of wondering hands. As the shaking hands event took approximately 4 hrs, Jiro and Arron who had to stand for long periods slyly did leg stretching exercises while shaking hands at the same time. The 88 Typhoon disaster, Fahrenheit's 4 members had the victims of the disaster on their minds, today they will perform to raise some funds, and also to gather goods and materials for disaster relief. At the location there will also be 3 trucks to help deliver the relief aid, using all the strength they have to help with the disaster relief. They typhoon was super sad. I scared when i saw it on the news. For real. I wanna be in aaron's arms tho! Does any know if they are all still SINGLE YES ARE NO. Whoa. I did not realize how off-topic this topic was! No I doubt any are single, or want to be dating at the moment, or want anyone to know they're single. They should become tour guides more often, then Taiwan would get more money. OMG i know, if they were my tourguides i would take the same tour like 5 times. Subject: Re: 8/15/2009 Fahrenheit Become Taiwan's Tourguides!